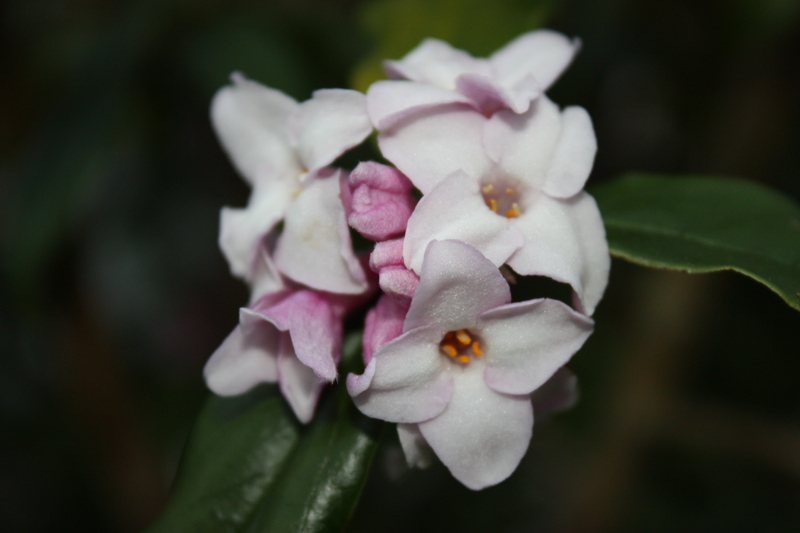 Daphne bholua ‘Jacqueline Postill’ is a wonderful example of a winter evergreen with its highly scented flowers. The scent from my mother’s Daphne (pictured) hits visitors to her house before it comes into view from about 30 feet away. Even for frequent visitors like myself it is still absolutely stunning as it is a rare thing to have such a fragrant showstopper in the depths of winter. It is well established now and is over 2metres tall. We are hoping to propagate from its ground shoots this year. Daphnes are borderline hardy and do need protection from frost. They grow well in beds or in a woodland setting. They do not like to be moved so plant it where its going to stay. Moderately fertile, humus-rich well-drained soil suits best. This should be near a path or patio so that its beauty and scent can be appreciated all the time. I made the mistake of planting one hastily in a spot where drainage was an issue when we moved back to Cork. I will be more careful next time. Daphne Odora is a rounded evergreen shrub and its flowers, which are also highly scented, are white. ‘Darjeeling’ is another cultivar that can flower before Christmas. It has very pale pink clusters of flowers. ‘Alba’ as its name suggests, produces white flowers and ‘Peter Smithers’ produces masses of flowers which are pink in bud and then open to white. Hammamelis mollis ‘Pallida’ otherwise known as Witch Hazel is a deciduous shrub or small tree. Its yellow scented spidery flowers make it a valuable addition to the garden in winter and it looks lovely as a specimen on its own or in the shrub border. Witch Hazel originated in Asia and North America in woodlands and along riverbanks. It prefers moist but well drained acid to neutral soil in full sun or partial shade. It is also valued for its beautiful autumn leaf colour as its leaves turn a gorgeous yellow-red colour before falling. Rosemary is as useful a kitchen herb as it is a shrub. If you don’t have this, now is a good time to plant it. It is an excellent accompaniment with lamb. Prostrate rosemary is a good ground covering plant and looks lovely spilling over steps and low walls. It is also useful for covering unsightly things such as manholes. Tall upright varieties such as ‘Miss Jessop’s Upright’ can be used as a hedge. But also works well as an evergreen in a mixed border. A hot sunny spot is best for Rosemary, as is the case with most herbs. If you have heavy clay soil like me, dig in coarse sand or grit and don’t let it sit in a wet waterlogged hole. Also try to place it close to your backdoor for practical purposes, or you won’t want to venture out on cold evenings to grab a few sprigs for cooking! – Purple sprouting broccoli can be started indoors now for planting outside in March. When transplanting, the soil should be finely raked, warm and moist. This vegetable is an antioxidant and is high in vitamin C and Iron. Harvest in June to September. – Plant some horseradish in a pot or corner of the garden where it cannot spread. You can buy a young plant or ask a friend or get a few roots from somebody who has a plant. Dig up a few roots a time when needed, three or four are usually enough. It is best with beef but delicious with smoked salmon too. -Cover cabbages, winter cauliflower and spring broccoli with netting to prevent damages from pigeons.